Finally, we come to the very last brownie recipe I made for browniefest: Emily Luchetti’s “Black Forest Brownies with Mocha Ganache” from A Passion for Desserts (Chronicle Books, 2003; p. 74). 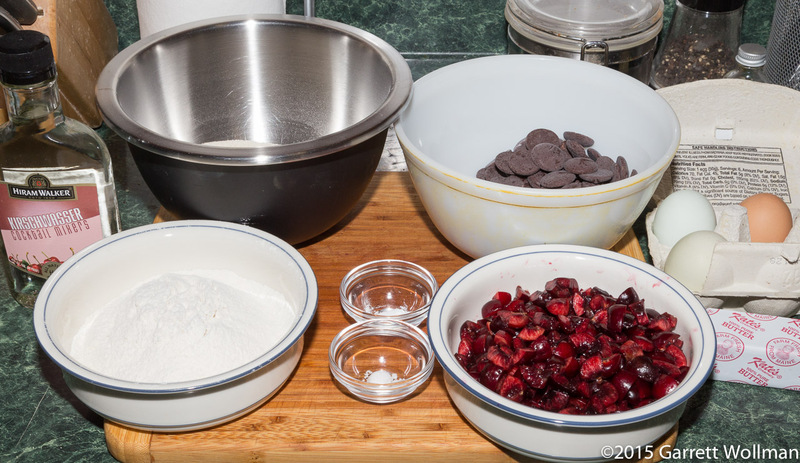 A number of the tasters were unsure whether this really properly should count as a “brownie” recipe, since the cake was as moist and soft as a rich torte, thanks to the inclusion of chopped fresh cherries in the batter. But I hadn’t known how it would come out, and the title of the recipe definitely says “brownies”, so in it stayed. This recipe has a half-pound of fresh cherries, pitted and chopped, in addition to the usual brownie ingredients. It has significantly less sugar as a direct ingredient, getting more sweetness from the chocolate (8 ounces “bittersweet” — I used the last of the TCHO 66% baking discs) and the ripe fresh cherries. The assembly is by procedure 2 (as described in part 2 of this series). I accidentally used a tablespoon of Kirschwasser rather than the teaspoon called for in the recipe, but I don’t think this made a significant difference to the outcome. Not shown here is the mise for the mocha ganache. Unusually (at least in my experience), Luchetti uses a combination of bittersweet and milk chocolate (for the latter, I used TCHO 39% milk chocolate baking discs); the coffee flavor comes from espresso powder, which is bloomed in the cream while it’s being heated. As I don’t like coffee flavors, I cut the espresso powder by two thirds. The ganache is then cooled in the refrigerator — I left it in overnight — and whipped to make a spreadable frosting. Luchetti’s instructions call for portioning the brownies first, before frosting, and so that’s what I did — on Monday morning, immediately prior to heading in to work, since these are extremely perishable. Each serving is topped with a single cherry, which has the effect of discouraging the tasters from breaking up the servings into even smaller pieces. Despite the disagreement over whether they count as “brownies” or not, “Black Forest Brownies” scored very well in the evaluation, with two “favorites” and an “overall impression” score of 4.0 (n=7) on a 1–5 scale. The scores for more specific attributes were similarly high, except for “chewiness” — they were anything but chewy and scored a 3.0 on that question — including the third-best “topping” score. I would gladly do these again, perhaps with a different topping. Unfortunately, the nutrition analysis is not all that favorable; even for these small servings, the calorie toll is quite high — although they do still count as “A Low Sodium Food” under FDA regulations. 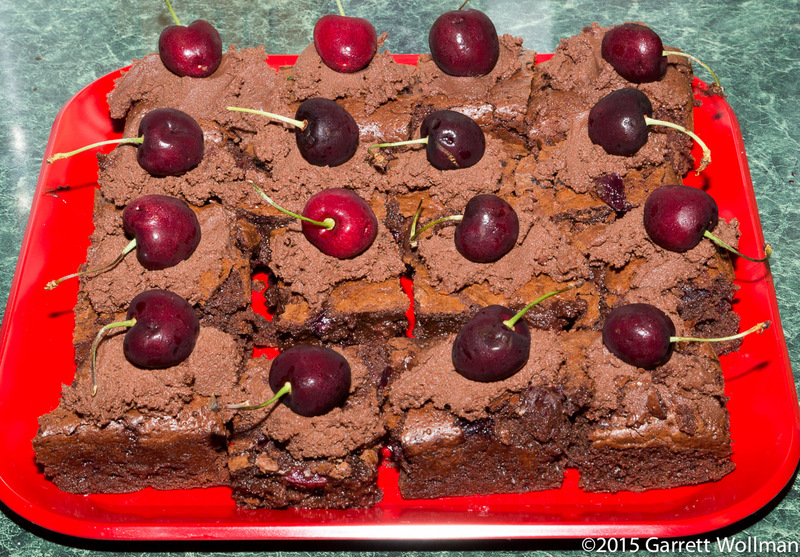 This entry was posted in Food and tagged browniefest, brownies, cherries, chocolate, Emily Luchetti, recipe. Bookmark the permalink.